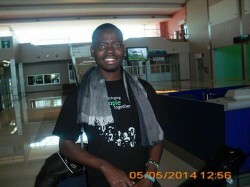 Oscar Matongo, the South to North (Youth Sport Exchange programme) volunteer from Response Network arrived on 21 st May 2014 after ten months. He was welcomed, at the airport, by Mutinta, Biemba and Lazarous – cashier, YSEP coordinator and communications officer at Response Network respectively. It was evident upon arrival that Oscar had benefitted a great deal from the exchange visit. He looked more confident and assertive. Asked how his 10 month stay in Norway was, Oscar simply described the stay as incredible! He said that it was a nice experience and that he learned a lot about the Norwegian culture and way of doing things. What struck him most was that Norwegian youths unlike in Zambia were free to express their opinion amongst elders. He was stunned that young people could rebuke elders without thinking about it while in Zambia it would be a taboo to counsel or correct an elderly person even if it was clear that he was wrong. We hope to learn further how Oscar will now combine and strike a balance between his culture and what he learned and experienced during his stint in Norway. In line with the YSEP policy, Oscar will serve at Response Network in the sports department for two months after which he is free to continue with his other aspiration. He hopes to contribute in a way to building Zambia after his new found knowledge. We wish him all the best at Response Network.